Today, TheHungerGamesExplorer.com revealed that the "Tick Tock" feature will act as a 12 week countdown to the release of Catching Fire. Each week, a new reveal will be featured! This week, we learned that advance tickets for Catching Fire go on sale October 1st from 9AM PT / 12PM ET. Judging by the fact that only US time-zones were quoted, we believe this is exclusive to American tributes. You can also enter a competition to win the original lyric sheet for "Atlas" hand-written by Coldplay frontman Chris Martin! Simply tweet using the hashtag #TickTock12 to enter (until September 11th). 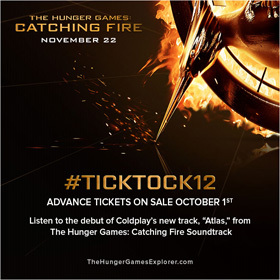 "Listen to the world debut of Coldplay’s new track “ATLAS” today, from The Hunger Games: Catching Fire Soundtrack, then share the link for a chance to win the original lyric sheet handwritten by Chris Martin & an exclusive #TickTock12 badge!"